It's polka dot day and I've got kind of a simple look today. Nothin' wrong with that though, I really like the way this turned out! Sometimes simple can be just what you need, you know? For this look I started with a base of two coats of OPI Nein! Nein! Nein! Ok Fine! 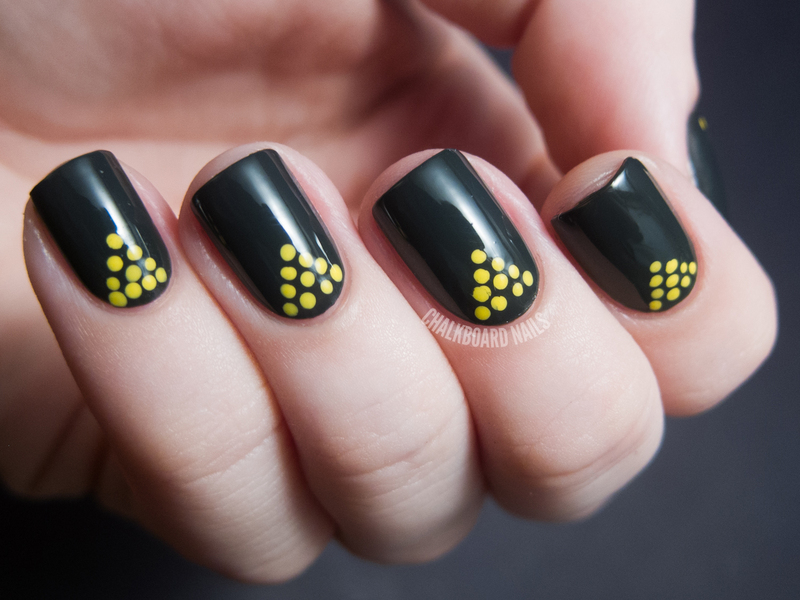 and then added small dots of China Glaze Happy Go Lucky in a pyramid shape. I have always been a fan of yellow and dark gray, I think they look so punchy and modern together. I didn't have anything specific in mind when doing this design... but since then I've had people say that it reminded them of a billiards rack or of a bowling pin setup! Totally unrelated to this specific design, I shortened my nails. Thankfully, it wasn't due to a break or anything. I just wanted a change for a bit! Last year's polka dot nail art was ladybugs! Make sure to check out the challenge prompts here. Beautiful! Kind of reminds me of a rack of billiard balls. Hope that isn't offensive. It isn't meant to be. It gave me inspiration to create A billiard mani someday soon. Where can I find nail art tools? My nails would turn out so much better with them. Nail art tools are sold a number of places like eBay.com, Amazon.com, MASHnails.com, and bornprettystore.com. There are also some available in beauty supply stores like Sally Beauty. I really love the simplicity of this! I love the dark gray color! I love how different this is from the usual "dots" look. Sometimes simple looks can be the best. This is super cute! That is neat! I kind of want to do this with different colours to make it look even more billiard ball-ish! 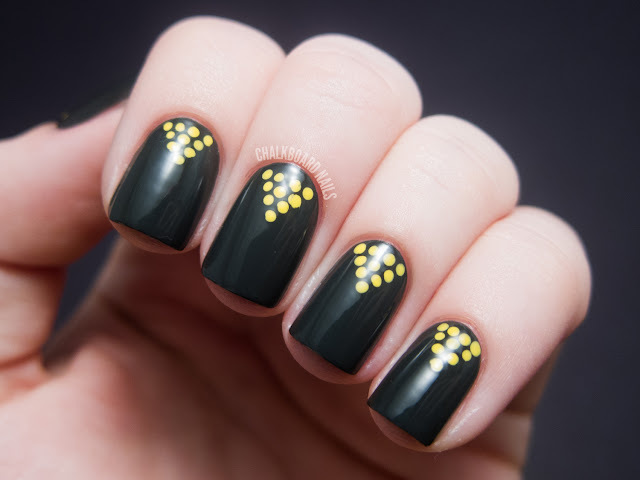 I love yellow and dark gray together too, I did a mani with those colors once and had a hard time taking it off. I keep looking at this OPI color and putting it back but every time I see it again I want it... I may have to give in. I like the simplicity of this mani and your new bb nails too! You always have the most inspirational manis this one is another pretty work of art. I didn't think Nein!Nein!Nein!Ok Fein! would be so dark. Now I'm doubting if I should by it. This looks so clean, very nice work! Looks like if it's stamped. Superb. 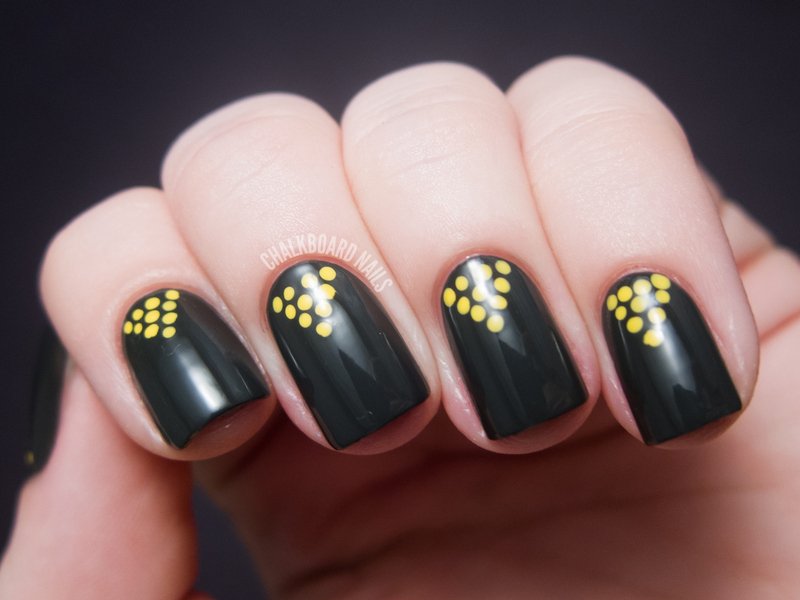 This is an awesome mani!! Simple but still so awesome looking!